REDDING, Calif. - Internationally acclaimed speaker and author Ravi Zacharias visited with more than 60 pastors and ministry leaders from throughout Northern California at an informal reception Feb. 6 hosted by A.W. Tozer Theological Seminary and the Office of the President at Simpson University. Dr. Zacharias was in Redding to speak at a Youth for Christ Shasta 25th anniversary fundraiser at the Civic Center. Prior to that event, he met with pastors in the J.D. Williams Suite of the Owen Center on Simpson’s campus, interacting one-on-one and sharing words of encouragement. Dr. Blewett said the event represented the seminary’s commitment to not only educate and equip but also encourage pastors in the North State. "We are delighted that we could encourage these pastors and promote the major event for Youth For Christ,” he said. Dr. Zacharias, founder and president of Ravi Zacharias International Ministries, has spoken all over the world and in numerous universities, including Harvard, Princeton, and Oxford University. His weekly radio program, “Let My People Think,” airs on 2,078 outlets worldwide. Dr. Zacharias has written or edited more than 20 books, his latest being Why Jesus and Has Christianity Failed You? 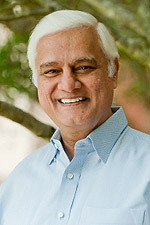 Ravi Zacharias International Ministries is headquartered in Atlanta, Georgia, with additional offices in Canada, India, Singapore, the United Kingdom, the United Arab Emirates, and Hong Kong. For more information about Tozer Seminary, visit simpsonu.edu/tozer.